From the 1920s through the 1960s San Francisco's Playland-at-the-Beach was the city's amusement park and carnival. Sprawled along Ocean Beach, Playland featured a funhouse, a midway with games, a roller coaster, and diving bell among other attractions. When Playland closed in 1968 few of those attractions survived. 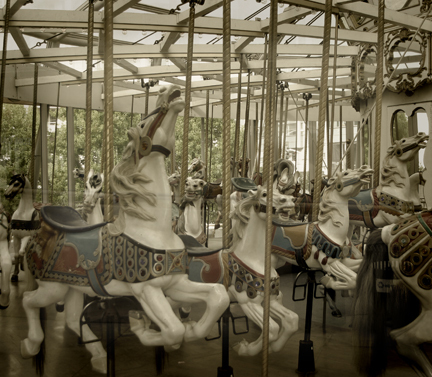 However the Musee Mecanique, a collection of penny arcade machines, has been relocated to Fisherman's Wharf and this marvelous carousel hand-built in 1906 was restored and purchased by the San Francisco Redevelopment Agency for $1 million. It is now installed in a beautiful glass pavilion at Yerba Buena Gardens.